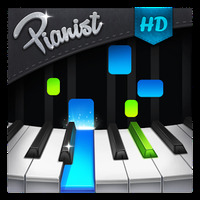 App description: Pianist HD is an entertainment application that teaches you to play piano on your mobile device. Functions: It includes works of many artists, allows you to record and play the lessons, you can select double or triple keyboard, digital or real sound, add vitality, store information in the cloud, and configure the keyboard and speed. Developer: rubycell is based in Vietnam	- Reputable developer. Rating: The TOP 5 Most popular Apps in Piano category. Ranking: The TOP 5 Most downloaded applications in Piano category. Lets you record and share your recordings. Teaches you how to play in a fun way. Uses a lot of much memory. Do you like Piano Teacher? A great piano game every K-Pop fan will absolutely love! Press the piano keys at the right time in this game! Download an amazing 3D piano on your Android!